A Classic Metroid Adventure Returns, Rebuilt From the Ground Up! Brave the hostile terrain of an alien planet teeming with vicious life forms as legendary bounty hunter Samus Aran. Her mission? Terminate the Metroid menace in this masterful reimagining of her 1991 Game Boy™ adventure. Samus Aran's arsenal has been enhanced with new moves and abilities that are sure to help her face the deadly surprises that await. 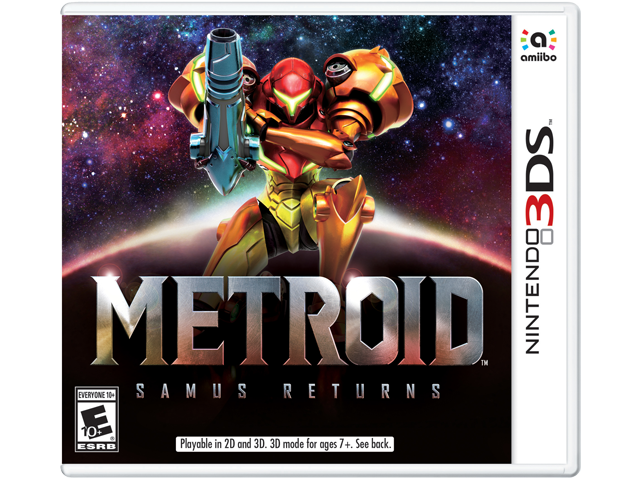 This intense, side-scrolling action platformer is a great entry point into the Metroid franchise and perfect for returning fans as well, and it's available only on the Nintendo 3DS family of systems. This intense, side-scrolling action platformer has been completely remade with engaging and immersive 3D visuals and a rich, atmospheric color palette. Classic Metroid II: Return of Samus gameplay is joined by a wealth of new content, including a set of brand new abilities that utilizes a mysterious energy resource called "Aeion," a powerful melee counterattack, and 360-degree Free Aim Mode. There are plenty of secrets to find — and if you uncover enough of them, you may even start to unravel the mystery of Planet SR388's past.